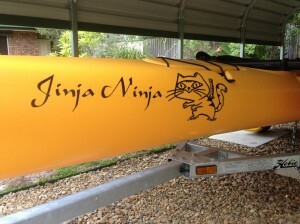 When we decided to make the “Jinja Ninja” official with a decal, the plan was always to include some graphic image. As the name was based on our ginger cat, the obvious image was a Ninja Cat. Looking for inspiration for an appropriate cartoon image for the “Jinja Ninja” I came across the “Kitty Ninja” by Will Terrell. Will kindly granted permission for us to use our design, so the next step was finding someone to make it. I contacted Joe from Professional Boat Stickers to turn it into a decal. Joe had a number of questions for us, including size and how we wanted to use it. He also pointed out the lines used in my initial drawing where too thin to create a long term decal. After a number iterations, we came up with the final product. The end result looks terrific and really personalises our Tandem Island. This entry was posted in SailYak. Bookmark the permalink.